As the economic crisis continues to bite, and governments rush to prop up failing banks, the neoliberal model is widely seen to be failing. This is therefore a good time, Andrew Robinson argues, to look back at the structure of economic power today. 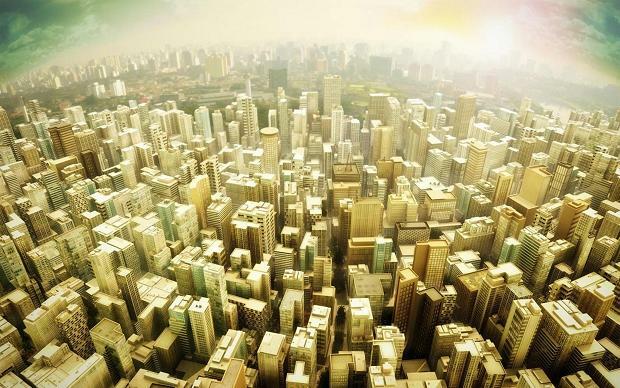 In a two-part essay, he takes on the incredible rise of global cities. This article focuses on “global” (aka “world”) cities. The idea of global cities came out of the field of globalisation studies. This was a major field of social science research in the 1980s and 90s, rather akin to terrorism studies today. It’s a lot less popular today, but still studied in many places. The debates initially pitted two groups against each other. The hyper-globalisers were convinced that the world was being turned upside down. Some predicted the end of the state, of national identities, and of capitalism as we know it. Others, known as sceptics, argued that globalisation was nothing new. Capitalism has been globalising since the early days of empire. This latest phase is just business-as-usual. After years of polemics, most scholars settled on a middle position. Some things have changed, some things have stayed the same. But specifying the differences is more complicated. People seeking to address the specifics of globalisation started to look at actual distributions of power. The old arrangement of nation-states still existed on paper, but had suffered blows economically. Some scholars, such as Hardt and Negri, argued that capitalism was now a smoothly distributed global space. Power is now equally present and absent everywhere. Yet this runs against the persistence of uneven development. In fact, wealth inequalities and exclusion are increasing worldwide. The idea of global cities was initiated by John Friedman and Saskia Sassen. In this theory, it is argued that a new international division of labour has been created. Economic functions have been redivided in the neoliberal era (from about the 1970s/80s). In some ways, it is a compromise between the view of a deterritorialised world and the view that nation-state imperialism remains in place. It recognises that space is still important, but also the importance of global flows. Global cities emerge from a functional, rather than a territorial, organisation of the world economy. In other words, the economic world is no longer divided into territorial units. It is divided into units which perform different functions in the world economy. This is sometimes said to express a capitalist, rather than a statist, arrangement of forces. Rather than flows being channelled by states for their own ends, they are channelled by the ‘world market’. Advocates of the idea of global cities suggest that cities have now overtaken other spatial units such as states as the main focus of capitalist organisation. Functions are now divided between cities or city-regions. The term ‘global cities’ is usually reserved for the top few cities with a truly global command role in the world economy. However, lots of other cities have undergone similar transitions. Many cities have turned into nodes within capitalism, with particular functions. It should also be added that some global cities are really massive areas consisting of several cities, sometimes with different governing regimes. For instance, the Hong Kong-Guangdong-Shenzen region is usually treated as one big metropolitan region, as is the Randstad urban area in Holland. The global city model is a solution to the capitalists’ problem of global command and control. They are divided into different ranks. The most important global cities – such as London, New York and Tokyo – are global economic command centres and basing-points in the organisation of world markets. Lower ranks of global cities mostly articulate particular regions with the world economy. The structure of cities is now often determined by how they are integrated into the world economy. Many cities or regions have large clusters of particular economic activities. Some perform specialised functions, such as production for a particular sector. Some cities operate as strategic gateways, channelling trade between certain regions. More detailed information can be found at the Globalisation and World Cities Centre’s website. A timely example is the clustering of hard-drive manufacturers in lowland Thailand. Timely because the recent floods have caused global economic effects, virtually destroying the global supply of a particular commodity. Global cities become sites of concentration of resources and information drawn from across the world or the surrounding region. They bring together different elements which are then combined in production. In many ways, they can be seen as the warehouse into which all the plunder goes, from which it is redivided among the raiders. In particular, they produce the central functions of the global system, keeping the system running. These cities tend to create increasingly specialised areas – huge business districts like London’s Docklands, city-wide industrial parks, ‘cyber-cities’, ‘creative cities’, and so on. Spaces are put aside for a single use only, and other uses are banned or discouraged. These areas come to seem like possessions of the relevant sector of capital, rather than of the local state or population. For instance, many areas reproduce the ‘orthogonal’ (right-angled, tall, upward-rising) architecture familiar from New York. Skyscrapers, high-rise offices and advertising hoardings dominate the landscape. The workers, excluded, minorities, and the poor are virtually invisible. Cities are now treated like metaphorical corporations. (Previously, they were treated like metaphorical factories). Power within global cities is mainly held by transnational capitalists and their allies in local growth coalitions. While formal governments and voters may be officially sovereign, capitalists have enormous ‘soft’ power and institutional influence. Even when they clash with the state, transnational forces in global cities usually win out. This is because power is moving from territorial to functional arrangements. After the financial deregulation and speed-up of the neoliberal period, global investors now have huge amounts of ready money to invest. This gives them the ability to demand extensive concessions in return for investment. They effectively take over the local power bloc. China for instance has been forced to relax most of its restrictions on corporations through a mixture of earlier refusals to invest, intense lobbying by growth coalitions, and quiet lawbreaking on the ground. The Chinese elite sought to introduce capitalist forces so as to extract rents, but found it unable to do so without empowering capitalists to refuse these rents. According to Castells, the power of global cities is based on flows which pass through such cities. These flows can be captured to some degree by the city or state. But other authors suggest that global cities become highly dependent on global networks. Although they might effectively secede from the surrounding national economy, and clash with national governments, they have little independent power of their own. They are utterly dependent on being able to attract capitalists. Power has been decentralised from nation-states to city and regional governments. Yet in many ways, cities have less independence than ever before. No longer do bodies like the GLC and Liverpool Council defy neoliberalism. Rather, cities everywhere compete to climb the global ladder or find a niche within capitalism. Even as they differentiate their functions, they become more and more similar. On the other hand, global cities don’t simply “happen”. They are the result of interventionist efforts by states and local governments to foster a developmental trajectory. They are thus very different from the borderless world or the decline of the state often predicted in the 1980s. A strong, but reconfigured, state is a central component of global cities. This is because states are well situated to create superprofit nexuses. States are sometimes said to have ‘denationalised’ under the pressure of global cities. These cities are no longer integrated with entire national economies. Instead, they form intersections between global cities and transnational actors. They are ‘glocal’, says Erik Swyngedouw – at once global and local. They are turned ‘inside-out’, says Edward Soja – oriented to outside forces, so the outside becomes their own core. They might even have ‘seceded economically’ from the national economy, says Peter Taylor – especially when the latter is in decline. The process by which global cities form is very competitive today. The more successful cities are often those which receive additional subsidies from a strong national economy. In effect, states dispossess hinterlands to subsidise global cities so as to consolidate the city’s position in the global hierarchy. They tax the peasants and small-towns, steal their lands, depress the costs of their goods, pollute their environment and so on – to the advantage of the cities. Often, cities try to become ‘global’ by attracting investment. In the South, this is usually foreign direct investment (FDI). Potential investors are offered tax breaks, repressive labour laws, pollution rights, guaranteed dispossesion of locals, and so on. Governments offer investments such as building roads and other infrastructure. In China, this is called ‘building nests to attract birds’. This process of attraction is both objective and subjective. On the one hand, global cities are zones which provide particular advantages. Some theorists, such as Peter Taylor, argue that capitalism always relies on something more than market relations. This is because market relations push profits down to the lowest possible level. Capitalists can only make massive profits if they find a way to create monopolies or something similar. Where particular conditions can be created in a location which are not available elsewhere, a ‘superprofit nexus’ is formed. Capitalists can gain much bigger profits than they could from markets alone. Traditionally, world-systems theory has seen this happening in terms of concentrations of skilled work, technology, and ‘high-value-added’ production. This was maintained by preventing technological development in the global South, guaranteeing superprofits to the North. It is still argued that this underpins attempts to impede Southern technological development. However, industrial production has largely been replaced by services in the Northern or core economies. Peter Taylor has suggested that global cities form a kind of superprofit nexus based on services and infrastructure. They provide monopoly products which can’t be found elsewhere and are difficult to copy. In particular, they concentrate services and ‘knowledge products’ aimed at capitalists in particular locations. Most often, a city obtains global status by providing a good context for elite lifestyles, elite corporate functions and rapid transport. Cities often have to run on the spot to maintain global status, creating innovations or strategic complexes. Yet they sometimes seek to monopolise the capacity for such innovation. Another aspect of this status is a particular focus on networking among elites. Global cities often provide services to elites. They also concentrate corporate headquarters in a small area. This means capitalists can meet each other and make deals, without running up travel costs. In many ways, the existing concentration of corporate headquarters in one place is self-reproducing, providing a monopolistic advantage. Yet there is also a strong subjective element. Global city status is a self-fulfilling prophecy. If international capitalists accept a site as a global city, it becomes one. A city which markets itself well can become a favoured site. Hence the huge efforts put into corporate networking and hospitality for visiting dignitaries. Hence the importance attached to summits, trade fairs, expo’s, major sporting events and so on. Hence the ideological manipulations in which cities seek to appear more vibrant, homogeneous, efficient and investment-friendly than they really are. This situation is not a world away from that suggested historically by world-systems analysis. The world-systems perspective has always maintained that the world is functionally divided and that states are not as important as they seem. Yet it also involves changes in the world-system. In particular, imperialism functions rather differently in the global era. The old ‘comprador’ classes and great-power clients have been replaced by, or turned into, new localised sections of a transnational class pursuing neoliberal goals. There is some debate in the scholarship about whether global cities form a hierarchy or a network. Neo-Marxists such as Friedmann argue that world-cities are hierarchically arranged. Some other scholars, following Castells, argue that they are basically networked. The network argument mainly comes from the high density of connections among global cities. They are strongly networked outside their territories. The hierarchy argument relies mainly on the fact that distributions among global cities are very inegalitarian. A few cities have most of the major command functions. The hierarchy is dynamic. Cities move up and down it. This is why the global city model is so seductive. It is attractive to poor countries such as China and India as a route from dependent production to high-end ‘core’ production. But on the whole, core regions have stayed at the top. In terms of the density of networks, East Asian cities such as Singapore, Shanghai and Hong Kong have caught up with the likes of London, New York and Tokyo. They are just as important as strategic nodes. But they have not developed command power on a global scale. Global command functions remain concentrated in the old imperial capitals. It seems, therefore, that a country pursuing development through global cities can expect more connectedness, but not more power. They don’t become part of the core – they just become a richer, more strategically important semi-periphery than they were. One reason for this is that they have big problems developing so-called ‘world-class’, i.e. core-like, financial and cultural institutions. In many ways, this pattern repeats the long history of developmentalist imitation. Regimes aspiring to develop usually do so by copying the countries deemed developed. Yet by doing so, they either come up against cast-iron barriers (the core won’t give up its monopolies), or else take away the superprofit status of the sectors they copy. A sector such as shipbuilding or computers doesn’t command superprofits because it’s inherently developed. It commands superprofits because, at a particular moment in time, only a few people can do it. The moment others manage to do it too, it becomes a normal market sector and its superprofit status is lost. However, state elites benefit from global city formation by extracting rents. In particular, they can make money by selling or renting land, or collecting taxes on high land prices. Sometimes, they will seize vast amounts of land from poor people or peasants to sell it to companies. State elites often reap profits from these processes. Corruption is endemic to global cities, and keeps state elites on board even when development does not occur. There is a close link between global cities and the basis of capitalism: accumulation-by-dispossession. In the neoliberal era, this type of accumulation has returned to its former centrality. « Previous: Debate | Helping the poor…by getting rich: ingenious or delusional?